Fortunately, Rex and the others weren’t badly hurt from Hoost’s attack. After sending them to the Eris Church, we went to the Adventurer’s Guild. This wench had been one sidedly lecturing me all this while! Yunyun was on the verge of tears as she strangled me. After I disengaged from her with some effort, I reached out my hand to calm her down. I thought about my own circumstances. I held Yunyun’s weeping face with both hands and said. I said as I opened the door to the Adventurer’s Guild together with Yunyun, who was still snuffling. My report sent the guild staff into a panic. I dragged Yunyun to a table further in the guild. Yunyun and I started our duo strategy meeting at a table in the corner. Yunyun said with a painful expression. Since there would be no reinforcements from other cities, the situation wouldn’t improve if we ignore the issue. And the life-saving Archpriest could not be found. Yunyun angrily said and suddenly picked up Chomusuke, who was scratching itself on the table. I was puzzled by her. Hearing my words, Yunyun clenched her fists in silence. Then she slammed the table and stood up…! As Yunyun was about to run off somewhere, I pulled on her cloak, causing her to turn back. I smiled gleefully at Yunyun who was coughing in confusion. I came to a certain place together with Yunyun, who was still pouting. Yes. This was our usual hotel. Hearing Yunyun’s voice behind me, I walked upstairs to a certain room in the hotel. Then I took a deep breath before the door. I strengthened my resolve and knocked twice on the door. A familiar voice came from within. I opened the door and saw Cecily sprawling on the bed and munching on some snacks. As I entered the room, I clasped my hands together and said. I hurriedly stopped Cecily who was about to rush out of the room. Cecily said with a troubled look. Cecily tried to pacify me as I strangled her by handing something over. She handed over a heavy sack. Hearing her casual words, I stared dumbly at the sack in my hand. Cecily listened to my queries. She said with a gentle smile. She then hugged me tightly. What should I do? I was a bit upset about it, but my eyes still became wet. Actually, I was uneasy about challenging such a powerful devil. —There wasn’t any gold coin inside. It was full of rocks and a piece of paper which said, “Just joking”. After going downstairs, I saw Yunyun worriedly pacing back and forth. After being noticed by Yunyun, I quickly wiped my tears away. I held up the sack of eris with both hands and shook it for Yunyun to see. Yunyun was on the verge of tears for some reason as she cried out in despair. I walked out of the hotel in exhaustion. I didn’t even have the mood to explain things to Yunyun, who was having some strange misunderstanding. I considered what she said. … I should just ignore it. I said and stuff the sack full of gold coins into her hands. I returned to the Adventurer’s Guild and approached various adventurers. Even after I discarded my self-respect and begged everyone, nobody accepted my request. This was because everyone knew of my bad reputation and the power of that devil. My plan was to let Yunyun acquire some magic items that could restrict movements and then employ some defensive adventurers. If Hoost’s movement could be restricted, it would be ideal. Even if we couldn’t defeat it, we could buy the employed adventurers some time and increase the distance for a one-hit kill. I thought that would work, but I was too naïve. Someone spoke to me fearfully from behind. I quickly turned towards the speaker…! 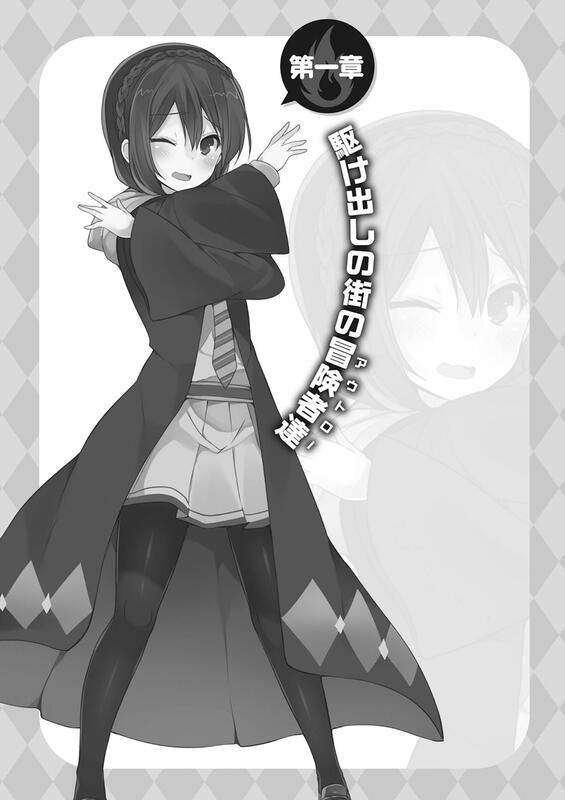 It was the idle uncle who would be drunk in broad daylight and approach Yunyun for chat, as well as other similar men. As I drove them off, the guild became noisy. I asked a random person nearby. If I came earlier, I could have invited those people…! No. Perhaps they would unexpectedly defeat it. Yunyun said and took out some magic items that looked really familiar. It was somewhat discomforting to buy the magic items at full prices when we could have acquired them easily back in our village. However, since the products were made by our villagers, we could be assured of the quality. Hearing this, I looked away. I picked up Chomusuke, who was pestering me at my feet, as if I wanted to avoid reality. Yunyun mumbled, but this was better than having no plan of action. I carefully kept the scroll. I tied Chomusuke in my arms to the doll. 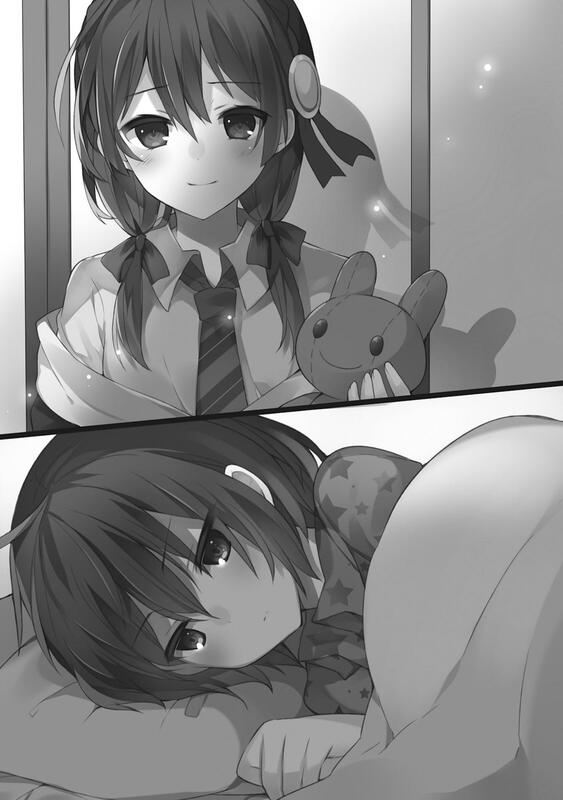 … It was unbelievable that the kind hearted Yunyun would become so callous in less than a year. This kid had grown in various ways before I noticed. I showed Chomusuke, who was bound to the doll, to the anxious Yunyun and said. Watching my silhouette as I made my declaration and turned towards the hotel, Yunyun sighed helplessly. I replied without turning back. There was a sound of someone taking a deep breath. Yunyun seemed to be mumbling something softly. After dinner, I returned to my room. I suddenly thought of something and knocked on Cecily’s door. After opening the door, I saw Cecily lazily lying on the bed. I was stupid to even ask that question. I showed Chomusuke, who was released from the back cat doll, to Cecily as she was busy taking notes. I put Chomusuke down on the bed that Cecily was lying on. Cecily ruffled its head as Chomusuke sniffed at her as if intrigued by a stranger’s scent. Cecily seemingly accepted my ultimate compromise. I watched Cecily play with Chomusuke on the bed and left her room. After leaving Cecily’s room, I ran into Yunyun as she was about to leave for somewhere. Hearing my question, she looked away suspiciously. Yunyun hurriedly responded as I cried out in surprise. Yunyun insisted on refusing my company. And rushed out into the streets at night. The battle will be tomorrow. Perhaps due to the nervousness, I found it difficult to fall asleep. Just a year ago, I was still peacefully going to school. How did I end up having to fight a greater devil? Thinking back, I had experienced a lot of adventures in the past year. Breaking the seal of the evil god, defeating the evil god’s minions, and fighting with the greater devil Arnes. And now, I’m defending the town of Axel and preparing to fight with the devil Hoost. There probably won’t be such a major event in my adventurer life from now on. What surprised me was that adventurers were people who frequently took on normal quests to make ends meet. I thought about this in the darkness and tucked my head beneath the blanket. This wasn’t good. My thoughts were just becoming more negative. Truly, was I becoming more negative because of tomorrow’s event? As I thought on this, I noticed the sky was starting to brighten outside the window. Or rather, it was today. I was so wide awake that I couldn’t sleep at all. What was it? I said to myself, something very important… Eh, ah! 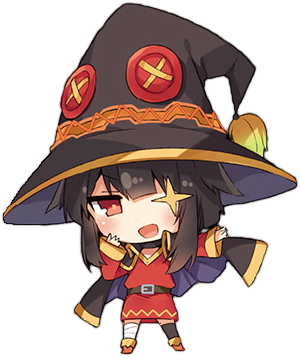 I forgot my daily practice of using Explosion magic! A whisper was heard from outside the door. The room became unlocked. What kind of pervert would pry open the room’s lock at this time? Cecily immediately flashed across my mind. I turned my back to the door and pretended to sleep as I clenched my fist to strike at the intruder at any moment. Finally, the door was gently opened. I heard a soft, familiar voice. My clenched fist relaxed. What was this about? Why would she sneak into my room at this time? It didn’t matter if I was awake, but for some reason, I chose to pretend to be asleep. I shouldn’t have pretended to be asleep. As I was regretting my decision, Yunyun softly continued her monologue. I wanted to pounce at her. At this point, Yunyun’s voice ceased. … Those times were my dark history, so I really wish you’d stop reminding me of it. Since my back was facing her in the dark, I wondered what Yunyun’s expressions were like now. … Yes. Just like the current me. If I got up now after hearing her monologue, Yunyun would receive a deep psychological scar. … At this moment, I couldn’t say that I didn’t even think about that. Yunyun said softly in a serious tone and picked something up. Even if I couldn’t see, I could guess what it was. It was probably the doll with Chomusuke’s scent, prepared as a bait for Hoost. Did she intend to lure and defeat Hoost before I could arrive? But Yunyun shouldn’t have the finishing move to defeat Hoost. No matter what, it was too reckless for her to do it alone. I listened to Yunyun’s confession and considered when I should get up. I jumped out of my bed as I woke up. As I quickly took note of my surroundings, I noticed that the sky outside was completely bright. Then, as evidence that it was not a dream, the black cat doll at the side of my bed was missing. Before anything else, the first thought in my mind was that I was upset at falling for her trap. She left early with a powerful party to defeat Hoost because she was worried about me. Normally, this might be a very good thing, but for me…! As I was shouting, I grabbed my staff and rushed out of the room—! As I rushed out of the door, I nearly ran right into Cecily. I didn’t have time to explain to Cecily, but it was still rude to ignore her when she was right in front of me…! I suppressed my urge to hurry and explained the situation. Cecily tilted her head. She smiled prettily and gave a thumb-up. What was this? I had a bad premonition. So she was responsible for complicating the situation! Except for Rex’s party, no other party would challenge the devil even if Yunyun took the initiative to talk to them. Still, Cecily only healed the wounded, so I couldn’t blame her for anything! At this moment, Cecily grabbed my hand as I was about to run off. I looked at Cecily’s expression and swallowed what I wanted to say. She was mumbling something and looking at me seriously. A gentle glow came from Cecily’s hand. Cecily smiled and breathed out in relief. Looking at her expression, I could only smiled stiffly. Then, I silently thanked this weird onee-san from the Axis Cult. In this urgent situation, I didn’t notice that I was panicking. Thanks to this, I was much more relaxed. In the plains outside of the town. The Giant frogs that are usually hopping around were missing. Yunyun and the others were in battle with the devil Hoost. The situation wasn’t good, but unexpectedly, Hoost was not without injuries. After losing one wing to the magic sword hero, Hoost currently has minor wounds on its body. And it gave the impression that it was weakened for some reason. Hoost threatened Terry and Sophie who replaced Rex in the frontline while complaining in a tired voice. Seeing Hoost struggling, I started to think victory might be possible. I wanted to rush into battle, but it was probably better to observe for a while. Or rather, this was not a good moment for a Crimson Demon to debut. It was fine to come forth at a dangerous moment, but doing so when one’s side was already winning was too lame. 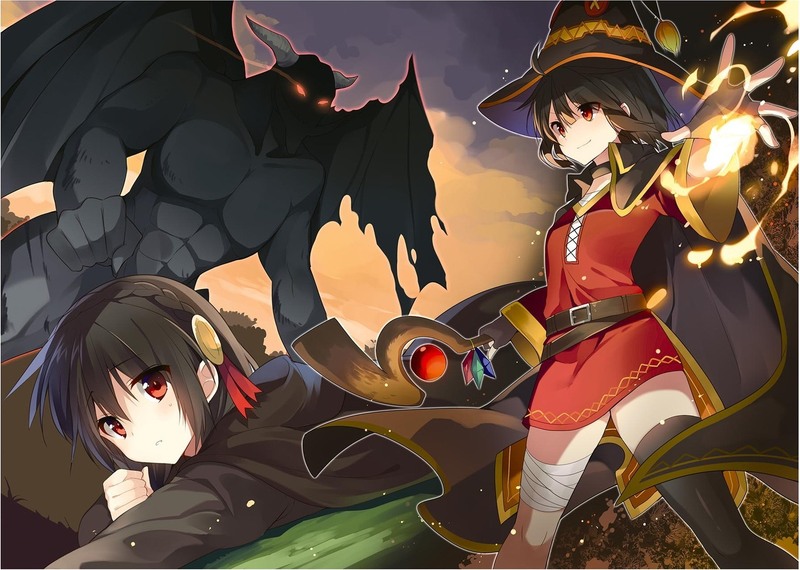 At this time, Yunyun held out her staff in one hand and gripped a small rock tightly in the other. She shouted in a resounding voice. The small rock in her hand disintegrated…! It brought its arms down as it shouted! 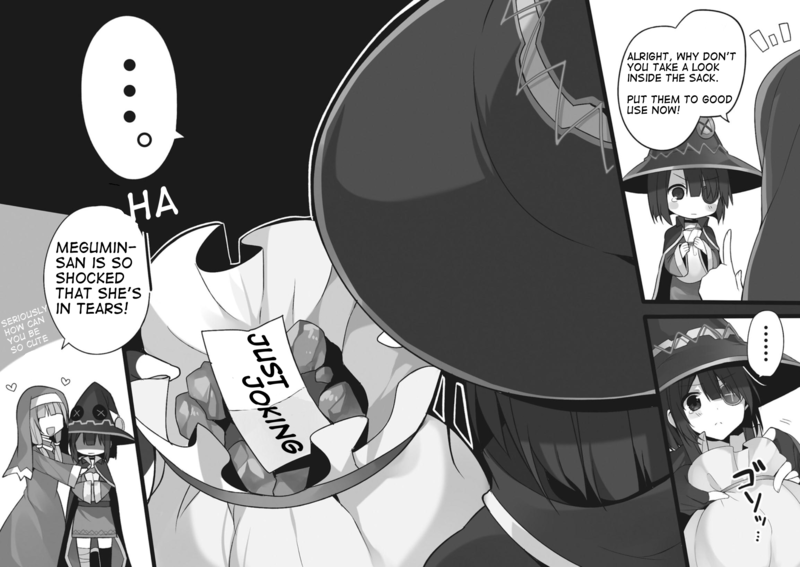 But Yunyun seemed to be expecting this. She released her staff and opened a scroll towards it with both hands. The spell that was supposed to emerge from Hoost’s hands did not appear. At the same time, the scroll before Yunyun turned black and was torn into pieces. It seemed the magic in the scroll worked, cancelling Hoost’s spell . Yunyun picked up the staff at her feet and took out a rock from her pocket. This rock was filled with magic power, but its price depended on its size and purity. 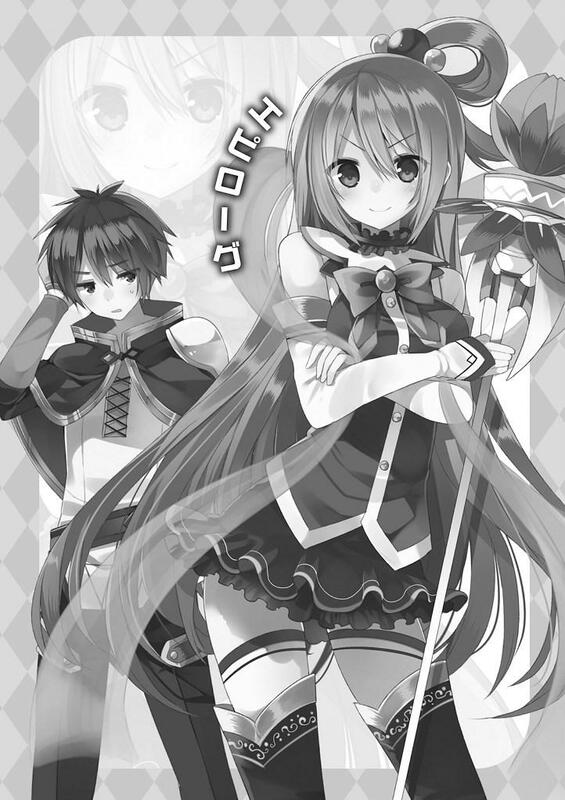 Although various expensive magic items were used, Yunyun managed to fight on par with Hoost. The enraged Hoost closed the distance with an agility that seemed completely at odds with its huge body. Noticing the situation, Sophie and Terry came in front of Yunyun to block it. Yunyun shouted and retrieved a scroll in preparation. That was probably a codeword for a battle plan that she and Rex agreed on. Hoost charged forward without concern…! At the same time, Rex and the others covered their faces. Following Yunyun’s voice, there was a bright flash of light! From the conversation, the two frontline fighters other than Rex had collapsed. There were then two sounds of something falling on the ground. The evidence was Rex’s anguish suspicion. The soft cry of agony was probably referring to me as I rolled on the ground while covering my eyes. I pressed my eyes, which were injured by the light, and squatted on the ground, trembling. I heard Hoost’s arrogant voice. I painfully opened my eyes and looked at Yunyun opposing Hoost directly. Rex stood at her side, holding his great sword in his left hand. The other two were on the ground. That guy named Terry or something was unconscious. As if to answer Hoost’s provocations, Yunyun quietly said to Rex. What should I do? The mood had become even harder for me to debut. Both of them endured the tense mood, then finally said something to each other that was too soft for me to hear. Although Hoost mocked Yunyun, its yellow eyes showed signs of caution. 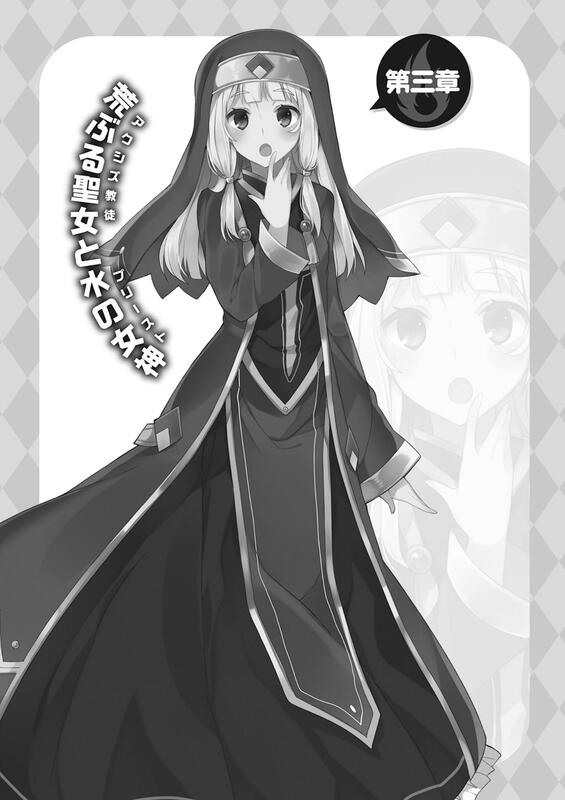 Hoost charged at Yunyun again as she drank the potion. Rex shouted and threw his great sword at Hoost. As if surprised by the enemy tossing away his weapon, Hoost was slow to react as its hardened arm blocked the great sword. Then, it used its broad arm to smash Rex, sending him flying away. 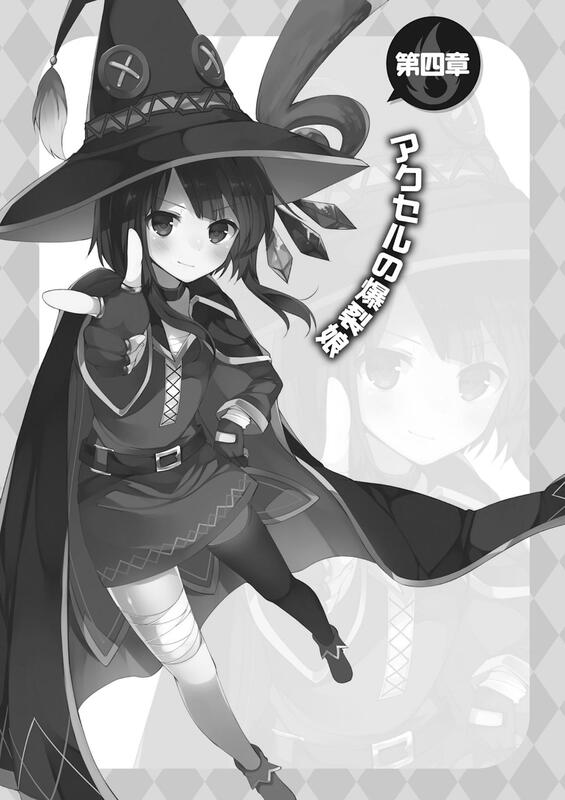 At the same time, Yunyun finished her potion and used a spell infused with all her magic power. The magic she used was to temporarily paralyze an opponent. Hoost gloated before trailing off. 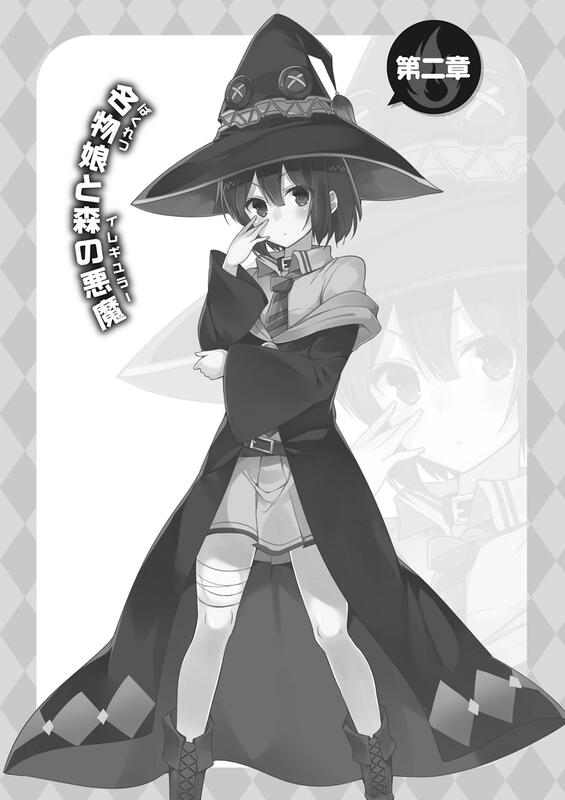 The potion Yunyun drank was commonly known as Magic Potion. Drinking it could increase the power of specific spells or directly change the spell’s effect. Since Hoost couldn’t move, the magic was probably effective. Yunyun didn’t use this at the start because she was unsure if it would be effective. But Yunyun won the gamble. Then, it would be finished if someone dealt the final blow to the paralyzed Hoost. As if it realized it was in real danger, Hoost was suddenly very talkative. But Yunyun did not answer as if she couldn’t believe the devil. Faced with her silence, Hoost became anxious and said. At this time, Yunyun softly said while trembling. By the way, Yunyun hadn’t moved from that spot for awhile. Yunyun said in a stuttering voice. Rex said from the side. Terry joined in as he regained consciousness. As if those words were the final blow itself, even Sophie urged her on. … But I already understood Yunyun’s current situation. They looked at the unmoving Yunyun. Its question resulted in an awkward silence. Finally, only Hoost’s laughter echoed across the plains. Hoost said and laughed out loud. Yunyun replied on the verge of tears. Normally, I should scold her for doing such a foolish thing. But after looking at the bottle at her feet, I hugged my head uncontrollably. That idiotic product that would drag its user down as well was probably created by my father. Hoost mocked her as it remained paralyzed. Rex and the others were still rather imposing earlier, but after hearing that conversation, they couldn’t say anything else. Yunyun stopped in mid-sentence while she was on the verge of tears. Hoost had the same reaction. After dispelling the scroll’s effect, I suddenly appeared. Its paralyzed body became even stiffer. It wore an expression of surprise. It was so rude to leave me behind. As if his pain was numbed, Rex lay motionlessly on the ground and warned me anxiously. As if she was a kid afraid of being lectured, the paralyzed Yunyun said and observed my mood. I raised my staff before me and pointed at Hoost. Hoost shouted at me in a stuttering voice. At the same time, Yunyun was shouting on the verge of tears. Yunyun cried out in anguish as she blushed deeply. She wanted to run away from here, but she couldn’t move since she was paralyzed. Yunyun cried like she was about to have a mental breakdown. For some reason, Hoost was happily looking at us. Then Rex, who remained silent all this while, shouted. In this situation, those words were unnecessary. 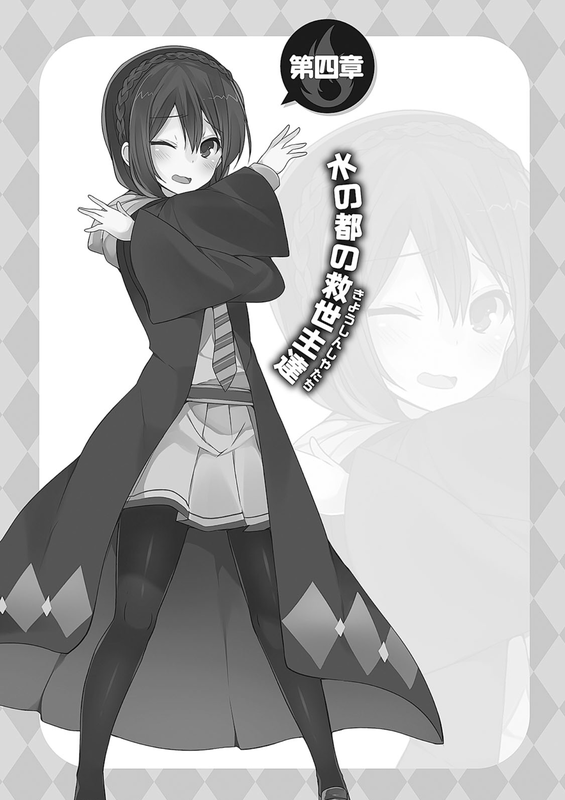 While I was making psychological attacks on Yunyun, I was also gathering magic power. Hoost said somewhat helplessly, and yet slightly happily as well. Perhaps because I didn’t use magic yesterday, the amount of magic power emitted today was abnormally high. The unrefined magic power spilled forth, causing the surrounding atmosphere to tremble slightly, accompanied by some static electricity. Rex mumbled to himself as he scanned the surroundings. He then turned his pale face to me and asked timidly. I didn’t respond. I merely smiled bitterly and said. Upon hearing the words “Explosion magic”, Hoost sighed deeply like a human. … It was difficult to read the expression of a devil, but it was probably smiling bitterly too. It grumbled as if it was making a confession. Then it happily said some strange things. Hoost was finally defeated, but after exhausting my magic power, nobody except Yunyun could move. It seemed everyone else was brought back on stretchers by the guild staff. That pathetic incident happened yesterday. I was embraced by Cecily at the hotel entrance, letting her rub her cheek against mine. How should I say this? Yunyun was still watching from the side. It was a bit embarrassing. Cecily finally let go of me as she spoke such nonsensical words. Then, she silently stared at my face and said with a laugh. That’s right. We gave the reward for defeating Hoost to Rex and the others. Or rather, I was the one who lured Hoost to the forest near the town. I stiffly smiled as Cecily enthusiastically hugged me again. Cecily said as she picked up the luggage on the ground and hung it over her shoulder. Hearing my question, Cecily showed an expression as if she was a kid plotting a prank. This was actually somewhat important. … It seemed she was eyeing this place. Then Yunyun, who was watching us so far, said seriously to me. —On the plains outside the town. The Giant frogs, which were hiding in fear of Hoost yesterday, were jumping vigorously all over the place. The silhouettes of adventurers hunting the frogs could be seen everywhere on the plains. At this time, Yunyun, who was walking in front, stopped suddenly. Yunyun blushed and pointed at me. Yunyun blushed as her eyes were filled with tears. She retrieved her staff and pointed it at me. Yunyun shouted loudly on the verge of tears. I smiled to one of my few friends. 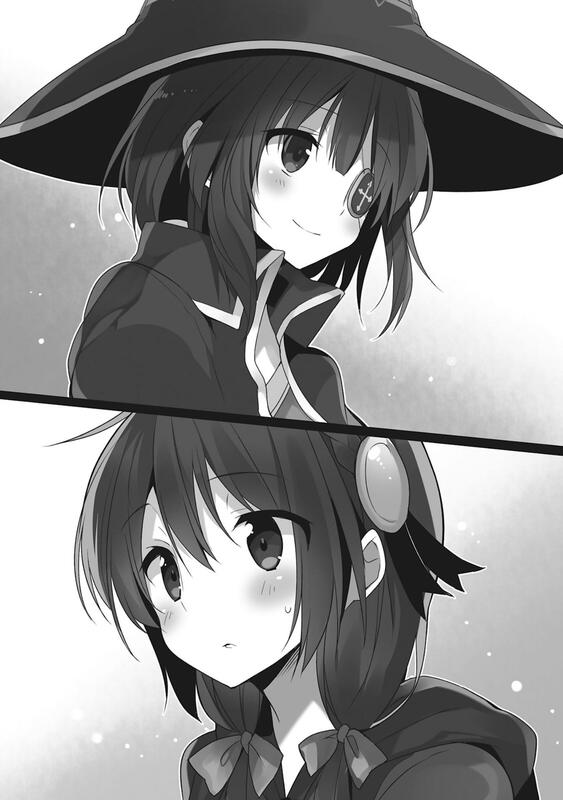 It had been two weeks since I bid Megumin farewell and left Axel. During this time, I visited two cities, but I didn’t find any adventuring companions. … Actually, it didn’t matter anymore that I couldn’t find any companions. As long as I had enough power, I would be able to gain levels faster by hunting monsters alone. And I was aiming to become the top mage of the Crimson Demons. 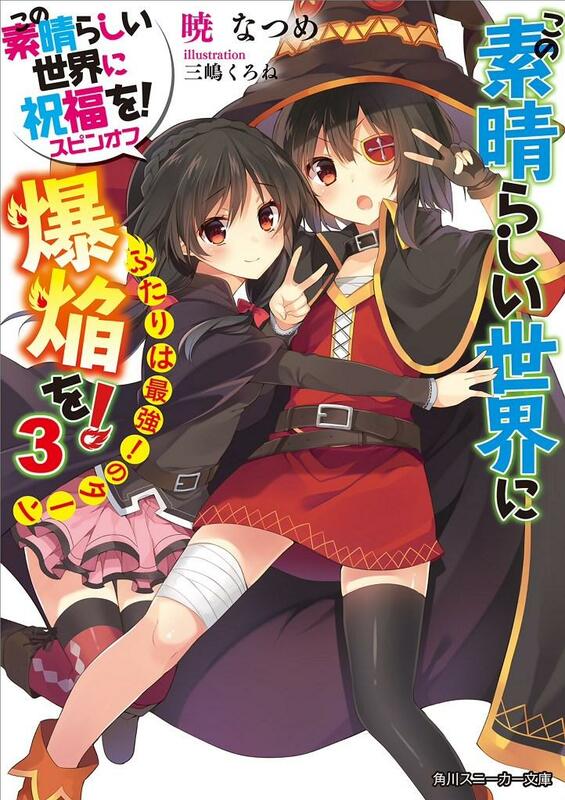 Not merely to catch up to Megumin, but to surpass her. To accomplish this, I was willing to take risks and fight powerful monsters. So I had no time to look for companions anymore…! I sat in the shaking public carriage and repeatedly tried to convince myself. … What should I do? I was about to cry. Goddess Lady Aqua. I’m very sorry that I lied. I really want some companions. I want reliable companions, preferably humans— No. As long as we can converse, it doesn’t matter if they are humans or not. I want companions that can adventure with me…! Just then, I heard a voice next to me. It seemed I was so troubled that I unknowingly started acting strangely. I shook my head at the worried onee-san who was talking to me. I said hurriedly as I felt my face heat up from embarrassment. The onee-san said and handed something over to me. It was some packaged snacks. She smiled at my confusion. I remembered when I came to Axel with Megumin, I got some snacks on the public carriage too. It was the aunt who had a kid with her. Those memories flashed across my mind as I took the snack. The onee-san removed her hood and looked at my eyes. There was only yellow in her eyes. The onee-san had short red hair. She looked at my eyes in nostalgia. The onee-san hurriedly stopped me as I was about to announce my name. … What a kind person. I felt it was rare to meet such a knowledgeable person. There were only two of us in the carriage. It seemed there were few passengers today. As I said “Itadakimasu!” and ate the snacks, the onee-san continued smiling. I told her everything that happened so far, even though she was a stranger. The events involving how I left the Crimson Demon Village with a friend for the town of Axeltown. Even with the most favorable qualities and conditions, I still couldn’t find any companions. I left my old friend behind and began my own journey in order to surpass her. As the onee-san listened to my story, she closed her eyes. She said and smiled in a somewhat lonely look. This onee-san must have experienced a lot. The onee-san nodded in understanding. I quickly agreed as I suppressed the urge to interrupt her. The onee-san was shocked. Someone finally invited me to travel together, yet her destination had to be Alcanretia. The onee-san’s expression changed when she heard “Demon King’s army”. She softly mumbled to herself. The onee-san violently grabbed my shoulders. It was useless to complain to me. —Then the carriage slowed down and finally stopped. The onee-san stood up and sighed without enthusiasm. She got off the carriage and waved at me. After the onee-san left, the carriage slowly started to move again. I put my face out of the window and waved to the onee-san. I engraved her words in my head. That was a famous story about the Demon King. It was a story about the lonely Demon King with a very strange name. The story about the powerful Demon King was to avoid letting one’s children become lonely like the Demon King. If one was alone, that special power would be meaningless. I still had that… How should I say it? Companion, or friend, or crony… Yes, that rival. I still had that rival. —One day, I will surpass her and become the chief of the Crimson Demons…! I watched the onee-san walk away and silently made my resolution. Then, I suddenly realized something.